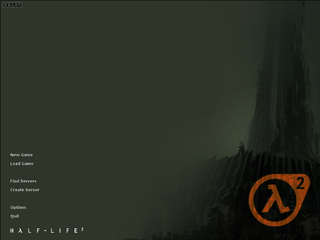 This page details one or more prototype versions of Half-Life 2 (Windows). 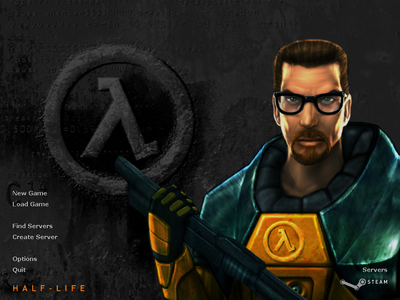 The Half-Life 2 Prototype (or Half-Life 2 Leak) was compiled on September 26th, 2003, more than a year before Half-Life 2 was released. It, along with the Source Engine's source code and several other Valve-related files, were leaked by Axel Gembe, a German hacker that had managed to get into Gabe Newell's account because of an easy to figure out password and began collecting and monitoring what Valve was up to. When Valve discovered they had been compromised and cut Gembe's connection in late September 2003, he quickly released what he could to the Internet before authorities apprehended him. Among what he leaked was the prototype. Back in the day, the prototype was a major black eye on Valve; not only for allowing themselves to be compromised in the first place, but also for showing that the game was in no way complete by the time September 30th, 2003, the game's original release date, rolled around. Now, it's a curiosity to poke around and explore, not something to insult Valve with. 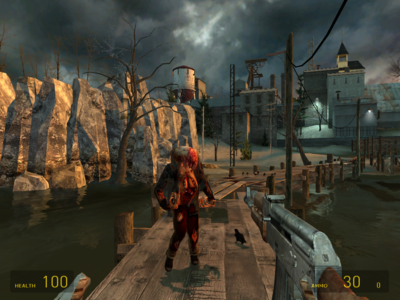 The prototype itself appears to be a WIP version of what would be the final revision, but the real gold in it are the many unused and obsolete resources, from textures to weapons, that have not been removed from the game's files when the prototype was leaked. This makes the prototype not only a work in progress of the final game, but also something of an archive containing old content that had been cut from the game long before the prototype was leaked. 14 The Mystery of "Spire"
So many cut enemies, so much space to document them. Rough textures, lots of textures from old Civil Protection versions, and more! Look at all those old Classic Zombie leftovers! Gordon Freeman's Missing Arsenal: A cautionary tale on proper gun storage. Dr. Kleiner's old model, unused textures from earlier development periods, different Citizen faces, and more! Every item got changed between the prototype and final game. There are some removed items too! Full conversations by temporary actors, sound effects, the full monty. The environment map textures contain images of several maps not in the prototype nor the final game. The many, many props and misc. models that didn't make it into the final game. From early versions of final maps to E3 2003 presentation leftovers, this prototype has it all. Leaked with the prototype was a collection of .zip files known as the "WC Mappack". The .zip files contain hundreds of .VMF files (the editable sources of a map), all at different stages of completion and dates, from mid-December 2000 to around mid 2003. When run through Hammer, most maps can be compiled but will be missing textures and models. There are so many maps, it's impossible to list them all here. The prototype contains almost all of the resources used in the E3 2003 demonstration that officially unveiled Half-Life 2. This includes maps, models, textures, audio, configs used to record and show gameplay footage, and even the demos used to record the footage seen in the videos. However, because of engine differences and issues with resources, most of these maps and demos are broken. If playing the maps, the player must follow the way the E3 2003 reveal videos played them, or else the maps will break (even more, in maps that are already busted) because of scripting issues. The prototype also has the same E3 2002 demonstration leftovers that the final game has. The prototype's GUI is almost exactly the same as the GUI used in the Steam version of Half-Life. 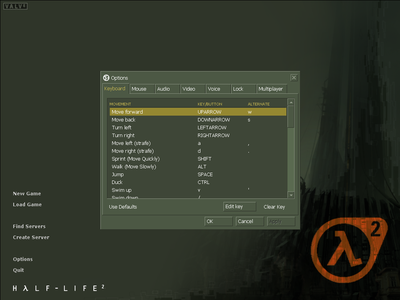 The differences are that the menu options are placed closer to each other in the Half-Life 2 prototype, the game's logo will change if moused over, the "servers" option and Steam logo on the right-hand corner in Half-Life is missing in the HL2 prototype, and the HL2 prototype console uses an early TF2 icon, while HL1 uses a small Steam logo as its icon. The "New game" option has a selection for "Training Room", like the Steam version of Half-Life does. If selected and the player tries to start a session, the game will do nothing. The console gives an error that shows the game attempts to look for a map called "t0a0" when this option is selected. t0a0 is the name of the first tutorial map in Half-Life. The prototype has barebones support for multiplayer. The player can create a listen server via the main menu, but the mode itself is quite buggy. The scoreboard uses a simple design that no Source game has ever used. The menu itself lets the player start a multiplayer game in any map, complete with functioning AI. It also has tab for game and CPU player options, but the game tab shows nothing and the CPU player options only has a single box to type random gibberish in. When the console is open, the game will show the text "Source Engine 2 ( build -4 days until 9/30/2003)" on the upper right-hand corner of the screen. 9/30/2003 refers to Half-Life 2's original release date, while the text to the left of it seems to be based on the date the prototype was compiled. Based on the state of the prototype, there was no way in hell they were going to hit that release date. By default, the prototype has the "G" key mapped to the function "dropprimary". However, when the G key is hit in-game, the game gives an "unknown command" error and nothing happens. Based on the name, it seems the player could drop weapons at one point. Perhaps the player could only carry a certain amount of weapons at a time? This function can be seen in action near the end of the Coastline E3 2003 video. Error that appears when trying to use the "DropPrimary" command. 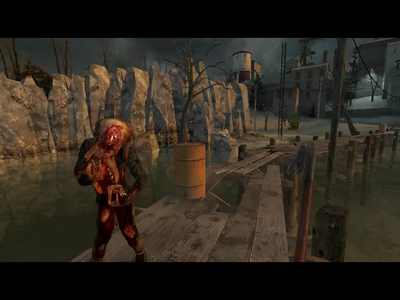 In the prototype, the player can attack while zoomed in. The final game removes this, presumably for game balance reasons. Reading the console right after the game has loaded shows that it's looking for two missing models; "models/shell.mdl" and "models/shotgunshell.mdl". These models were used in the original Half-Life for ejected 9mm brass (shell.mdl) and shotgun shells (shotgunshell.mdl). 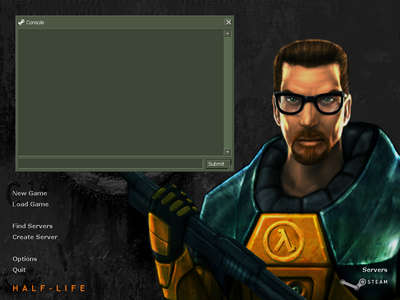 This suggests that this function to see if shell.mdl and shotgunshell.mdl are in the game's file is either a very old leftover from Half-Life that hadn't been removed yet, or is code from Half-Life Source, which was also in development at the time, that wasn't removed from Half-Life 2 for whatever reason. The lack of shell.mdl and shotgunshell.mdl does not cause any issues, since different ejected brass models are already used in the prototype. The prototype's files has some files related to Steam, such as files for setting up the server browser and text on the main menu. The root folder for model textures has several folders that were removed in the final game. They are "Bathroom", "Electronics", "Furniture", "Junk", "Lighting", "Pipes", and "Vehicle". These folders contain a folder for each texture instead of dumping them all in the directory, like the prototype and final's prop folders do. 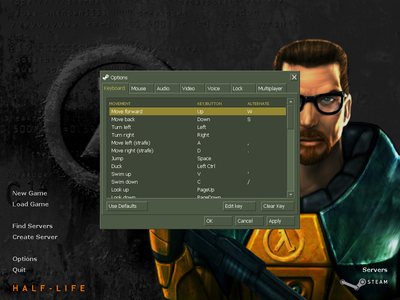 In addition, the textures are named differently; all of the textures had "W_" (probably standing for "World", like the weapon world models in the Half-Life games do) at the start of each one's file name, all of the words in a description are capitalized, and some even have the texture size listed in brackets. Since there are so few of these and the fact that many of the textures in these folders appear elsewhere in the prototype, it's likely they are leftovers from an earlier development period and weren't completely removed for whatever reason when the prototype was compiled. The root textures folder contains a text file called "oldtrans". Inside it is a list containing two sets of texture names. The ones on the right correspond with many textures in the prototype. The left set appears to be old names for the textures and some of the texture names are somewhat similar to how textures are named in Half-Life's WAD files. Oldtrans.txt also reveals that textures were named based on what location they were going to be used at one point. The locations are Urb (City 17), Vert (Vertigo, a cut skyscraper location), deep (Kraken Base, another cut location), hyp (Hyperborea, an old name for the cut Borealis), Waste (the Wasteland, which became the final's Coast and Nova Prospekt locations) and Spr (an unknown location). There are folders in the WC Mappack corresponding with these location names, but they are empty. 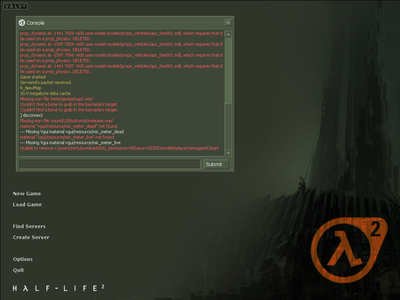 This text file appears to be an old leftover, as it lacks several of the locations seen in the prototype or Raising the Bar (such as the cut Air Exchange, Canals, and the Citadel) and some of the names are somewhat close to how Half-Life named its textures. To read all of oldtrans.txt's content, go to the subpage below. The WC Mappack contains an empty folder called "spire". No maps of this location have been found in the WC Mappack. Spire is also mentioned in oldtrans.txt and has its own skybox, suggesting development advanced enough for it to get a unique sky. The question is: What is Spire? While its maps no longer exist, there are some hints as to what it would be. Raising the Bar has a short story made by Marc Laidlaw, Half-Life 2's writer, about a battle for a location called "Weather Control" (or "Weather Station"). Weather Control is also listed as a location in an early game progression chart shown in Raising the Bar. According to the story, Weather Control would take place in a snowy environment. Raising the Bar's summary of the location says it would take place in the Arctic. "Spi" stands for Spire. Based on the textures' names, oldtrans.txt indicates that Spire would take place in a snowy environment. Remember how the Weather Control story stated the Weather Control was in a snowy environment? Weather Control is the only location mentioned in Raising the Bar that does not have any material for it in the prototype nor the WC Mappack. Spire also lacks any connection with any locations mentioned in Raising the Bar. Also, Weather Control is the only snowy location mentioned in Raising the Bar that does not appear in the WC Mappack. While there are only some texture names to go on, it is likely that Spire is Weather Control as both would take place in a snow-filled area. Spire being Weather Control also gives Weather Control representation in the prototype and WC Mappack's resources, which it does not appear in otherwise. It would be strange for a location that was important enough to get marked on an early game progression map and given its own short story to visualize it would not appear at all in the prototype's resources and the WC Mappack, while other locations mentioned on the early game progression map, such as Kraken Base and the Borealis, are. This page was last modified on 20 March 2019, at 06:56.